Philadelphia weather is heating up and so are the odds of having a summer storm that causes massive property damage requiring emergency tree service. Philadelphia homeowners can protect trees and property with the Top 3 actions for tree service provided by Giroud Tree and Lawn. Tree uprooted in summer storm. Giroud Tree and Lawn recommends tree pruning to thin crown and allow air to move easily through the tree. As Philadelphia weather continues to heat up, the odds of having a major summer storm also intensify. These high wind and rain storms often result in massive tree damage requiring emergency tree service. Giroud Tree and Lawn provides the Top 3 Actions homeowners can take now including tree trimming, tree cabling and hazardous tree removal. How does a homeowner know if a tree is weak? “The best approach is to have a professional tree service with ISA Certified Arborists check tree safety now,” says Mr. Giroud, President of Giroud Tree and Lawn and ISA Certified Arborist. "An ISA Certified Arborist will look for cracks, decay, excessive deadwood, structural defects and other problems." The Top 3 actions for tree service to prevent summer storm damage are tree trimming, tree cabling and hazardous tree removal. 1. Tree Trimming: Professional tree service crews are trained to thin crowns and remove crossed, weak and dead branches to ensure high winds can easily move through the tree. 3. Tree Removal: Trees that are dead or have unstable root systems are hazardous and must be removed. Considered the most dangerous operation performed by a tree service, tree removal requires professionals with the knowledge and equipment to safely remove trees even in the most challenging locations. Homeowners can keep their trees healthy with regular pruning and inspections, which will ensure trees have the best chance of survival against high winds and heavy rains. 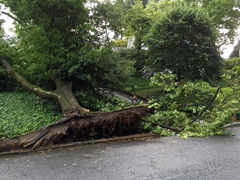 In Giroud's video, ISA certified Arborist Rob Nagy shows what can happen when a tree can't stand up to the strength of a storm and how it lead to a big problem on one property in Elkins Park. “Summer storms can hit without warning. All trees near a home or other valuable structure need to be thoroughly evaluated for safety by an ISA Certified Arborist. An evaluation is often free. The potential to save the homeowner from extensive tree damage is priceless. The resulting tree service recommendations which may include tree trimming, tree cabling and hazardous tree removal will ensure homeowners can keep trees and property safe. Before choosing a tree service company, homeowners need to check the company’s references, professional credentials and insurance coverage. Ask for a written estimate and the company’s customer satisfaction policy. These simple steps will help to ensure the tree service is done to professional standards and the homeowner is satisfied with the end result.